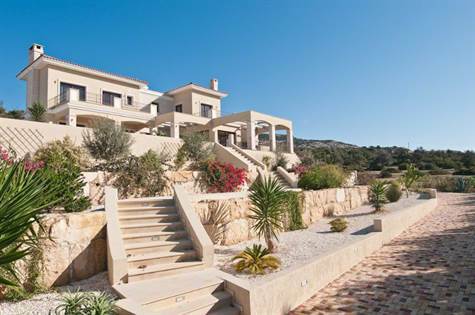 Sea Caves, Paphos - The words "totally unique" come to mind when describing this superb luxury home. Situated on an elevated 1870 sqm plot at the end of a quiet residential cul-de-sac, it has the most stunning views of the sea and the surrounding countryside of this exclusive Sea Caves area. The property is on three levels and has been specifically designed and custom-built for the current owners, who have paid attention to every detail, and used the very latest state of the art finishes. A brick paved driveway leads round to the front entrance of the house and a covered parking area. Starting with the lower level, there are two large bedrooms, one with en-suite shower room, and the other with en-suite shower room and fitted kitchenette. There is also a large utility room and separate store room off the hallway, together with a lift to the upper floors. One level up is the living accommodation featuring a huge light and airy living room divided into a comfortable lounge/cinema room with log stove, and a spacious formal dining area. The separate kitchen/breakfast room, with central island, has every quality kitchen appliance you can imagine. Opposite this is a large study/office with direct outside access for visiting clients. On the upper floor are 3 double bedrooms, all with en-suite bathrooms. The master suite includes fitted wardrobes with mirrored doors, and patio doors lead out to a large balcony with fantastic panoramic sea views. The 2nd bedroom also has it's own private balcony. The outside space is just as impressive with a 300 sqm terrace area accessed via patio doors from the living room and kitchen. Near the kitchen is an outdoor dining area and built-in barbecue/bar, wonderful for outdoor entertaining. Next to this is a comfortable seating area overlooking the wonderful mosaic tiled 12 x 5 overflow swimming pool that is salt water treated and "swimwear friendly." Views can be enjoyed from all levels of this superior, dream villa.